Taking advantage of cloud services doesn’t have to be difficult or a long-phased migration project. Today we're excited to announce General Availability of the SharePoint Migration Tool, a simple, and fast migration solution to help you migrate content from on-premises SharePoint sites and file shares to SharePoint or OneDrive in Office 365. Based on the learning and experience from Microsoft FastTrack, the SharePoint Migration Tool from Microsoft was designed to help you bring your information to the cloud and take advantage of the latest collaboration, intelligence, and security solutions with Office 365. With a few simple clicks in the intuitive user interface, you can quickly and easily migrate files from file shares, SharePoint sites, or support bulk migrations. Whether you’re looking to migrate from file shares on-premises to SharePoint or OneDrive or from on-premises versions of SharePoint, the SharePoint Migration Tool supports the smallest of migrations to large scale migrations with support for bulk scenarios. SMAT.exe will determine the version of SharePoint on which it’s installed and run the appropriate tool based on the parameters passed to it. Works on both SharePoint 2010 and SharePoint 2013. Custom Permission Levels. Enumerates and reports on all locations that a custom permission level has been created. External Lists – Enumerates and reports on all external lists (BCS connected) in the environment. Default filter added to site language to exclude 1033. Default filter added to Customized Pages to exclude anything under _catalogs. Retry logic added to calls to remote resources such as SQL Server. This will help the scans succeed in environments with suspect connectivity. -r switch added to command line to enable an operator to specify the number of retries. Default is 3. Ability to generate a full identity report that provides a comprehensive view of the users and groups that have access to the SharePoint environment and if they were able to be mapped to Azure Active Directory identities. Ability to generate an identity mapping file that can be consumed by SPMT or other tool that can use the SMAT identity mapping format. New identity mapping scans configured in the same scandef.json file as the assessment scans. SharePoint Identity Scanner - Discovers all the users and groups that have access to SharePoint. Active Directory Identity Scanner - If the identities found in SharePoint are Windows accounts, lookup Active Directory information for the users and groups. This data is useful to track down identities that did not have a mapping in Azure Active Directory. Azure Active Directory Identity Scanner - Look up users and groups found in SharePoint in the Azure Active Directory tenant the user logged into. Determine if there is an Exact Match, Partial Match, or No Match. ExactMatch – Windows SID in SharePoint matches the OnPremisesSecurityIdentifier in Azure AD. PartialMatch – Claim value in SharePoint matches UPN or email. Display Name in SharePoint matches Display Name in Azure AD. NoMatch – Unable to find an exact/partial match. While the SharePoint Migration Tool and SharePoint Migration Assessment Tool provide support for many migration scenarios, we recognize your needs may differ in scope and complexity. For more complex migrations, support with adoption and usage, or help planning Microsoft FastTrack includes resources, tools, and experts to make your rollout of Office 365 a success. 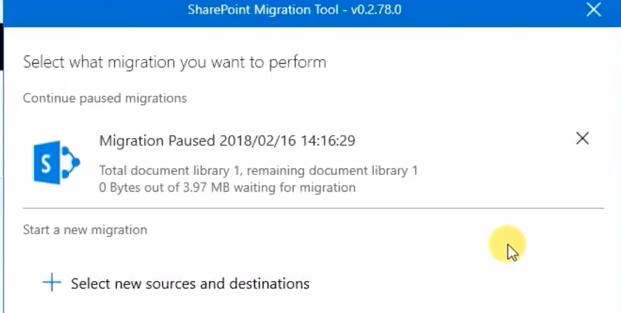 To get started and download the new SharePoint Migration Tool from Microsoft visit https://aka.ms/spmt. To get started and download the SharePoint Migration Assessment Tool visit https://aka.ms/smat. Great news ! Thanks for sharing @Bill Baer ! Thanks @Bill Baer...can you please confirm build 0.2.75.0 is the GA release? @David Leveille Yes, build 0.2.75.0 is the GA release build. Thanks for clarifying, @Helen Hua! Enjoying the latest bits, @Bill Baer. Worked for file share to sharepoint online tenant great! Fast too. Keep these great updates coming! SMAT doesn't support SharePoint 2016? @Jussi Palo SMAT is limited to SharePoint Server 2010 and SharePoint Server 2013. The docs mention username and password. Does it support federated identities with smart cards? @Dávid Sass I'm adding @Simon Bourdages to comment on roadmap and federated identity. I may have missed it; but, does it migrate lists with this release? List support and ADFS for on premise is something that are not currently supported but are in the work and should be added relatively soon. to have it the soonest you can select first release from the install page. Is there any plan to support SP 2016 in future? We do want to support 2016 in the future but we are going to tackle 2010 support first before that. @Jimmy Hang the tool normally doesn't halt on a specific issue we normally process all files we are able to. one possibility would be that the rest of the files where locked. if you feel like something is not working the way it should I am happy to chat more, simply send me a private message here and we will look at it. So after about 1+ weeks trying to work with support. I am at the end of my rope. I have been using the SPMT since its initial beta release with mostly positive fellings/thoughts & experience. however it appears that right around when this went GA I have been having ongoing issue with all my batches. I typically am seeing these errors on all new migrations I run. Also 1 thing I noticed, is I have 3 servers running the tool. On the first (the initial one that was using the beta) The tool says its version 0.2.75.0. The progress bars are a solid color. The errors I have been receiving are below. The other errors I am seeing is: Invalid Site URL (basically it tells me the path to the users onedrive is not valid) However when I click on their name/link in the tool its takes me to their Onedrive. (However I have noticed that If the tool throws that error, & I instantly click on the users name to take me to the site, I get a generic Sharepoint "Something not right" error page. I refresh the page & 99% of the time the page loads, I have had 2-4 that had me click refresh 2-3 times but then show. System.InvalidOperationException: This implementation is not part of the Windows Platform FIPS validated cryptographic algorithms. For the solid bar versus not, This is based on your windows version and your graphic settings. The tool will adapt to your machine to make sure the visual still works. For the Second part, it seems like this issue is based on the fact that the tool is not FIPS compliant Yet, I have noticed you have sent me an private message also. Let me help you out on the second issue in that private message to not clutter this thread. Also worth noting the great typo you made me realise, this should be saying Unexpected instead of expected exception. Thanks for that we will fix the typo as well. I urgently need the ability for this tool to migrate lists, especially Picture Libraries, and also the ability to migrate from one tenant to another. Can i add another thing as well - the ability to schedule data migrations, in order to keep the files already migrated up to date and to be abel to automate the final data migration for a customer. @Tim Massey , We appreciate the feedback and are definitely working on improving the tool. In my initial testing from a fileshare, the migration worked really well. Only one concern so far... the moment I ran the SPMT, my CPU was pegged and SPMT was consuming 70% of CPU (prior to starting any migration). Anyone else seeing this? Thanks for your feedbacks. Please contact Migration feature crew <migration_team@microsoft.com> for issue investigation. We would like to work with you to address the issue encountered in your migration. Say @Tom Castiglia I saw it on the preview bits, but not on the GA bits. @David Leveille - hmmm... I'm almost certain I was on GA bits. I haven't tested since. I'll need to try again. Let me know how it goes, @Tom Castiglia. Been a while since I've been in that tool as well. Is there any limitations on how much size this tool can migrate? Limitations on site size, large lists etc.? @Sudhir Kesharwani Generally speaking, Files or folders exceeding current SharePoint Online restrictions and limitations will not be migrated. There's a 15-gigabyte (GB) file size limit for each file that's uploaded to the OneDrive for Business library. We have a sharepoint 2010 site where we ran this MSAT (Microsoft Sharepoint Assessment tool) and found these errors. root cause of these errors and, if these errors could be road blockers for migration to Sharepoint Online. How can we resolve these errors? at Microsoft.Sharepoint.Migration.Scan.Common.Scanner.BaseScanner.Run() in C:\BA\4\s\Microsoft.SharePoint.Migration.Scan.Common\Scanner\BaseScanner.cs:line 203"
05/04/2018 12:45:37.14,0xa,Error,SPHelper,"Failed to get site info from the specified site collection. SiteID: 74022571-636a-46f5-9d22-4fe2cdb8e0f4; Error: System.UnauthorizedAccessException: Attempted to perform an unauthorized operation. at Microsoft.Sharepoint.Migration.Scan.Common.Utilities.SPHelper.GetSiteInfo(Guid siteID, SPSite site) in C:\BA\4\s\Microsoft.SharePoint.Migration.Scan.Common\Utilities\SPHelper.cs:line 274"
05/04/2018 12:45:38.22,0x1,Error,CustomProfilePropertyMappings,Unable to locate a Profile Database. 05/04/2018 12:46:12.15,0xa,Error,SPHelper,"Failed to get site info from the specified site collection. SiteID: 256f0d87-43bc-4b7d-9d48-037d79b4aa03; Error: System.UnauthorizedAccessException: Attempted to perform an unauthorized operation. 05/04/2018 12:46:12.16,0xa,Error,SPHelper,"Failed to get site info from the specified site collection. SiteID: 74022571-636a-46f5-9d22-4fe2cdb8e0f4; Error: System.UnauthorizedAccessException: Attempted to perform an unauthorized operation. 05/04/2018 12:46:12.17,0xa,Error,SPHelper,"Failed to get site info from the specified site collection. SiteID: 46beced2-74cf-41f9-a281-ccb78a8086b2; Error: System.UnauthorizedAccessException: Attempted to perform an unauthorized operation. Good progress on this tool now able to migrate libraries other than Document Libraries, which hugely lessens the work load of some migrations. @Tim Massey Thanks Tim for your great feedback. Can we use this tool to migrate big data e.g. 15TB from local folders to SPO? Hi, @Fady Monir , the tool was definitely built for scale. 15TB should be no problem for the tool. That being said you want to consider splitting up a bit your content since even if SPO supports up to 25TB of content in one site collection, the best practice is to divide up your site collections for better usability and performance of queries. before, I was able to run migrations, & close the tool when they were done. & then when I restarted the tool I could see those migrations. today I logged back into the app, but the previous migration is not there...am I mistaken that the previous migrations should show up so that we can start a migration? or get the logs? Is the migration with CSV good for you now? if not, please contact Migration dev servicing migration_team@microsoft.com and attached the logs and CSV file. Regarding to the "strange issue" you posted, it is not a bug. Since SPMT V1.1.90.1, a new feature "Support of incremental check on target environment " is delivered. if you migrate the same data source and same target again, it only migrates delta. The new feature is mentioned in release notes of SPMT V1.1.90.1. on the prior version I could have sworn that when the app is closed & I hit yes to save the migration, the next time I launch the app & auth then migration would be there to work with it again. Glad to know you solve the CSV issue and migration is smooth. Current SPMT v2.x99 behavior is exactly what the feature "Support of incremental check on target environment" addressed. In SharePoint Online, an incremental check of the target environment is performed already, If the modified time of the source file is earlier than the modified time of the target file, the file will not be migrated. less manual touch for delta migration is there. Is this good for you? that used to work, however now I am unable to find / see/ access the previous migrations. are you saying that the feature was taken away & replaced by an invisible check? Since SPMT version 1.1.90.1 and beyond, if you want to resume, just launch SPMT with the same data source and target, you can achieve resume capability. The resume mechanism is different since SPMT version 1.1.90.1. Basically, the tool now have target validation when resume. Is this good for you? Regarding the article update, I will discuss internally. @Steve Lindsey Yes. Basically you achieve the resume by delta migration addressed by "Support of incremental check on target environment". The video you watched was a Beta release, Version 0.2.78.0 indicated it. SPMT V1.1.90.1 is V1 public availability version. Now latest SPMT are V2.0.99.14. I will always recommend you using the latest version and improved feature sets, make sense? SPMT V1 lets you migrate files from your SharePoint on-premises document libraries or file shares to SPO. SPMT V2 lets you migrate lists or files from your SharePoint on-premises document libraries or file shares to SPO. SPMT V2 supports. To learn more about list templates SPMT V2 supported, go to https://docs.microsoft.com/en-us/sharepointmigration/sharepoint-migration-supported-list-templates. @Steve Lindsey Soon SPMT will have PowerShell support. Hope you try the latest version of SPMT and enjoy it. @Steve Lindsey Resume functionality is there with V2.0.99.14 and it works. Please let me know if you find resume is broken with SPMT version beyond V1.1.90.0. You can always achieve resume by migrating with same data source and target. Looks like there is a gap between documentation and communication on resume. I will follow up internally. What is the maximum number if lines in a script that can run during a migration? I am using a CSV file and received an error message regarding too many items in the migration. @Tim Massey with the latest version you can now have up to 1000 rows in your CSV. you will want to use multiple vm and instance of the tool if you want to run more in parallel. If you have a lot of those its actually a good practice anyway to split the tasks up in many vms for even better throughput. We are acknowledging that there is a gap currently with the feature for Resumability compared to what it used to be and we are working on restoring that as soon as possible. Sorry for the confusion.